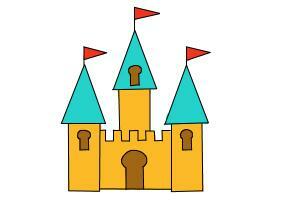 Is this an Irish castle or an English castle or a Scottish castle- or is it just Sleeping Beauty's castle? 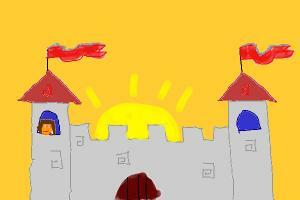 To draw this stone castle, first sketch a cylinder in the front backed by a box. Then draw parallel curves on the cylinder for the balconies and sketch in the turrets in the end.Now draw arched doors and windows and pattern the top edges of the castle walls. 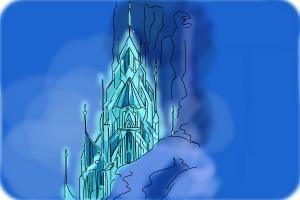 Use the airbrush for the blue sky and paint the stone castle in shades of grey with the shadows in a darker shade. The doors and windows are almost black for depth.With the pencil tool, carefully draw the balcony railings and outline the whole castle in black. AWESOME DRAWING DUDE, HOW DO U DO THAT , DONT U GET CRAMPS N UR HANDS??? Thanks! Yes, this one took longer to draw becuase of the details. But I did it in 2 sittings - that way I got some rest! you draw very wellThat's great that you think so. How long did u practice drawing?! Quote:Originally posted by: Tiffany0806How long did u practice drawing? !After 10 years I was comfortable drawing all kinds of professional stuff. after another 10 years, I learnt to be good at a variety of media - including the computer. Quote:Originally posted by: Tiffany0806THAT WAS THE BEST CASTLE I EVER SEEN!!!!!!!!!!!!!!!!!!!!!!!!! 5 STARSthanx a zillion.